EK Water Blocks releases the EK-Vector RTX 2000 Series water blocks for the new NVIDIA GeForce RTX 20 Series graphics cards featuring the new NVIDIA Turing architecture. EKWB releases a total of 8 EK-Vector RTX 2000 Series models for the reference GeForce RTX 2080 TI and GeForce RTX 2080 graphics cards. The new EK-Vector RTX water blocks are designed for the reference NVIDIA GeForce RTX Turing-based graphics cards featuring a slim single-slot design. 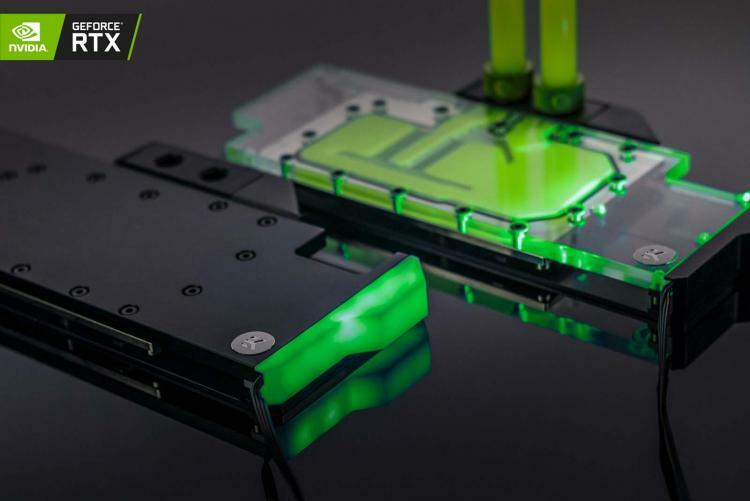 The EK-Vector RTX water block comes with the unique and aesthetic block Terminal with the “GeForce RTX” logo visible from the side. EKWB offers 8 variations of the EK-Vector RTX, four for RTX 2080 TI reference cards and four for RTX 2080 reference cards. The EK-Vector RTX is a full-cover water block that delivers direct and superior cooling to the Turing-based GPU, GDDR6 VRAM chips, and the voltage regulation modules or VRM. The superior cooling capabilities of the EK-Vector RTX offers higher overclocks with greater stability to unlock the highest possible performance from the GeForce RTX 20 Series graphics card. The eight variations include combinations of materials like bare electrolytic copper, nickel plated electrolytic copper, black POM Acetal, Acrylics with some of them having added standard 12V LED strips. The EK-Vector RTX features a redesigned cooling engine with a larger base plate for a larger footprint thus improved heat dissipation. It also features an Open Split-Flow design with low hydraulic flow restrictions offering efficient cooling even with weaker pumps. The EK-Vector RTX 2080 Ti RGB and EK-Vector RTX 2080 RGB water blocks comes with a standard 4-pin 12V RGB LED strip that’s compatible with ASUS Aura Sync, GIGABYTE RGB Fusion, MSI Mystic Light and ASRock Polychrome RGB. All EK-Vector RTX 2080 water blocks are compatible with reference design NVIDIA GeForce RTX 2080 graphics cards. Also, all the EK-Vector RTX 2080 Ti water blocks are compatible with reference design NVIDIA GeForce RTX 2080 Ti graphics cards. Unfortunately, the EK-Vector RTX Series water blocks are not compatible with the factory backplates. Hence, EKWB offers EK-Vector backplates that will passively cool the backside of the graphics card, available in black and nickel colours. Learn more about the EK-Vector RTX water blocks and its pricing here.